New! 180ct Tablet Value Size Saves You Over 30%! 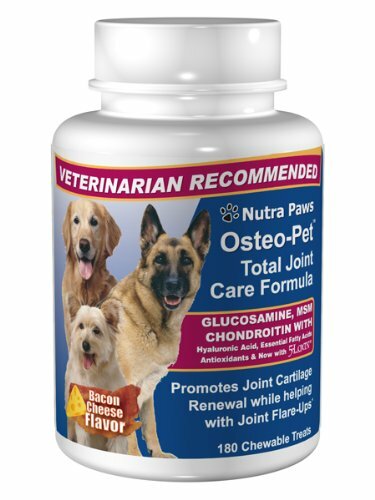 Complete Formula - Glucosamine Chondroitin, MSM, Hyaluronic Acid, Green Lipped Mussels, Collagen, Vitamins C & E, Boswellia Seratta Extract and Omega 3 Fatty Acids Formulated for Dogs. This Is The Most Complete Glucosamine For Dogs Formula Available. Osteo-Pet Total Joint Formula offers the latest proven science in a tasty treat designed to help rebuild and repair worn down and damaged cartilage. Hyaluronic Acid for dogs - this is a non-sulfated glycosaminoglycan distributed widely throughout the connective joint tissue found in knees, elbows and other joints. It is a primary component of the synovial fluid lubricant found in all bendable type joints. Green-lipped mussels for dogs are another source of high levels of glycosaminoglycans, which help assist in the repair of damaged joint tissues. Vitamin C for dogs may sound redundant because unlike humans, dogs can produce their own vitamin C internally. But, during stressful times like injury, pain or joint cartilage damage, it's beneficial to offer your dog a backup supply of antioxidants like Vitamin C.
Another powerful antioxidant for dogs is Vitamin E . Vitamin E can decrease the production of prostaglandins and leukotreines. This offers anti-inflammatory benefits to your dog's joint pain. Collagen is the main protein of connective tissue in dogs and animals. Connective tissue, like cartilage, is the primary component of synovial joints. Essential Fatty Acids for Dogs can help decrease painful inflammation in joints. A positive side effect is that essential fatty acids can also help improve the luster and shine of your dog's hair, skin and coat. Boswellia for dogs is a newly discovered natural anti-inflammatory to help stop swollen joint inflammation. This uses the same bacon & cheese flavor as the original Osteo Pet formula. I have 3 German Shepherds and I give them this supplement daily. They are all Schutzhund and I noticed a big difference in their drive after about 2 weeks. We can't see any inside wear and tear on our dogs. But it is there. I give this to my GSD's every day now. Great product.